I did. I just wanted to soften it up. Here's the before. While working in the studio today, I found myself taking a soft blue/grey to it. When I started, I was thinking about what I was going to recover it with. 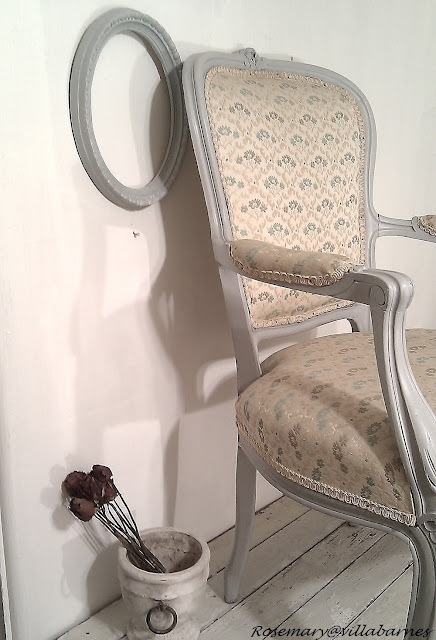 As I continued to paint, I started loving the new color with the old fabric. It works. So, I think I'm just going to clean up the fabric a little more. Would you change the fabric? Just curious. I could go either way on the fabric....it works as is, but drop cloth is always fabulous! Great paint job! I'm loving that new paint color with the fabric.... I might just leave the fabric... it looks great. You can always change it later if you get tired of it. For now... it works! It works alright! I love that new soft gray color with the fabric. Perfection in my book. (Love that frame behind it, too). I'd give it a go as is....it's not bad and the paint job really, really helped! Love your work! 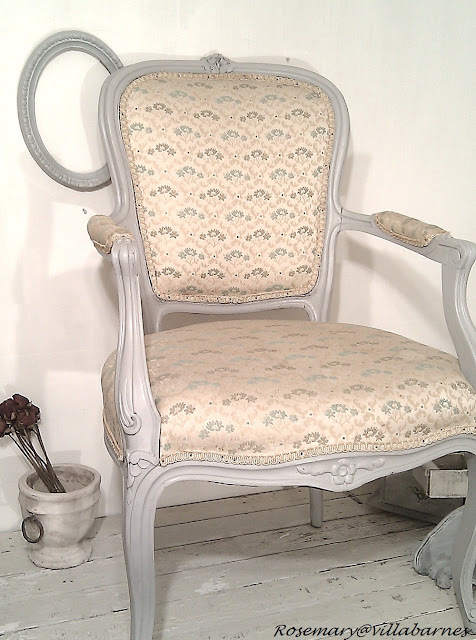 Wow, the new paint color really transformed the fabric! Leave it! It's a perfect match! I love this progressive transformation. Leaving it as is until you find that "spot on" fabric works...patience is a beautiful thing! New follower here! No, I love that fabric with the color you picked. Looks fantastic! I have a similar chair and not sure if I want t opaint it, but I like how yours turned out. Love that shade of gray. If you are enjoying that fabric now, I would leave it. You can always change it to something different later if the mood strikes you. Love the new paint colour! looks lovely with the fresh paint. If you like the fabric I'd leave it, Rosemary. I think the paint color goes very well with it. You can always change it down the road if you find a fabric you fall in love with. The old fabric looks very good! Was a good color choice! Good job! No. I like that fabric with its new paint color. I assume you're selling it. If it doesn't sell, then you might consider changing the fabric to see if that makes a difference. Definitely a good choice. Looked nice to start but is so much nicer now. Rosemary I love the newly painted chair...what paint did you use? It is perfect the way it is..you can always change the fabric later if you want. Stencil a chandelier on it. Done! I love the new paint color and I probably would recover perhaps with a lovely pale aubergine or lavender print or solid. I love those colors together! 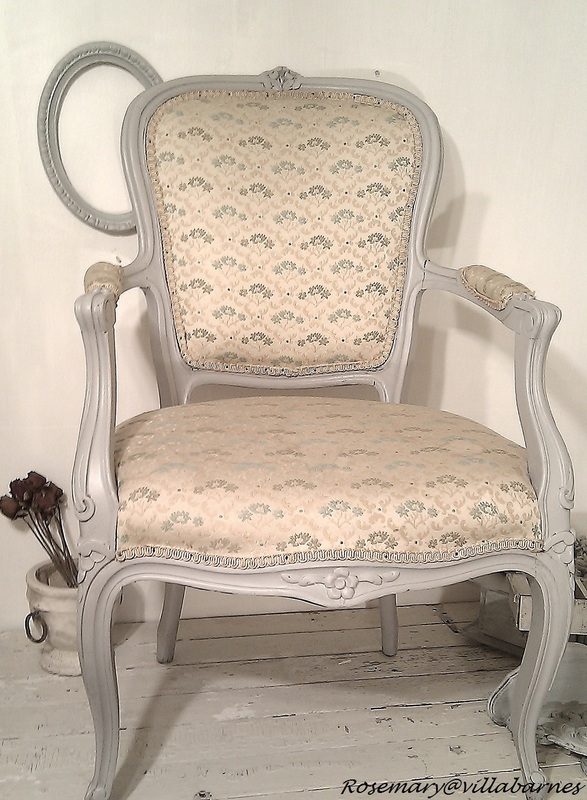 That paint really transformed the chair! I probably would change the fabric, but it does look nice the way it is. To me that fabric is a keeper with the new paint color! Love it!! looks great! It really does soften it up! I think the paint works really well with the fabric. Like it very much since you've painted it. The fabric and paint complement one another. Both are soft and subtle. 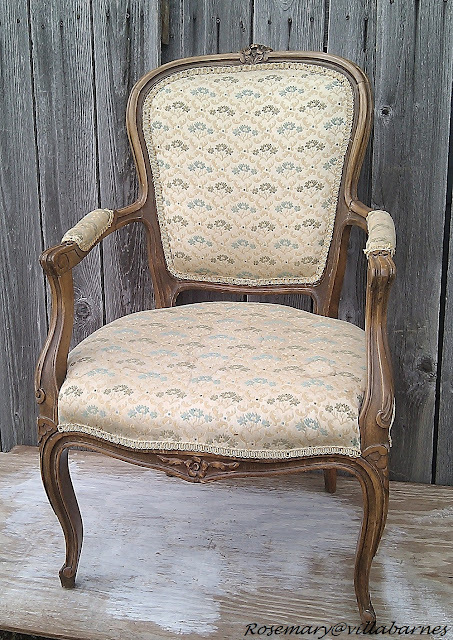 I agree the fabric works.I am redoing a french chair.I am however changing the fabric.Wish I did not have to but it was in very poor condition.As much as I love it.It must go. Really loving that color too. Thanks for stopping by and leaving a sweet comment! What a beauty, Rosemary! 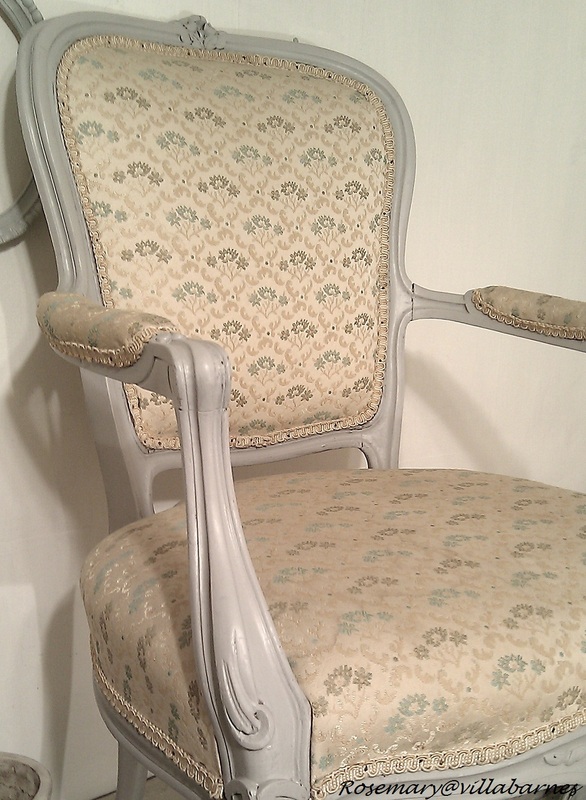 The new paint color is gorgeous with that fabric! So feminine! But you know me.....it would look great upholstered with a vintage grain sack, too. lolol! Beautiful transformation!! I think the new paint color/old frabric makes it lovely. Agree adding a little highlight silver (?) -what ever u think- would be special touch but nice as is! No, I would leave it the way that it is, it looks lovely now. I enjoy your blog. Nope. think the fabric looks great with it as is. LOL -- I didn't think there would EVER be something you'd think NOT to paint! Much better with the fabric (which I too love). I wouldn't change the fabric, it is very pretty with the grey paint and the printed cover. If it were me, I know it's not, but if it were, I'd leave it! I would I am still regretting leaving it behind! i love the new finish on the chair. the fabric is not me at all- i would go plain jane but with texture like linen or burlap, or i would go with something funky and modern. i am just not a floral fabric kind of gal though. Rosemary-I love the fabric with the new color. I so agree, and happy that you left it.